The God Rocks! 'flip-flop and rock' when Chip becomes a real boy and the band hits the road for their first concert tour. The hilarious plot thickens when their faithful rock-hound Ruff runs away before the group's first television appearance! Flip-Flop and Rock features award-winning songs, cool animation, loads of laughs and the great message of God Rocks! 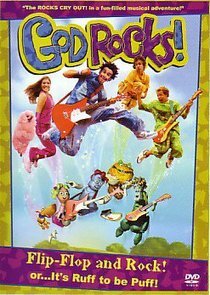 About "God Rocks: Flip Flop and Rock"